KILZ Chalk Style Paint is a decorative paint designed for upcycling furniture. Can be applied over most existing finishes with little to no surface preparation. Easily adds character to any surface. KILZ Chalk Style Paint goes on thick and provides excellent coverage and hide. Depending on your desired look for your project, simply apply one to two coats on a clean, dust-free surface. Lightly sanding your surface will help with adhesion. To enhance durability, seal your surface once it is dry with KILZ Clear Sealing Wax. To achieve a vintage appearence, seal with KILZ Dark Sealing Wax. Apply to old or new wood, cast stone, concrete or properly prepared metal surfaces. Not for use on horizontal surfaces subject to foot traffic. Shake can thoroughly before opening for application. Dries to the touch in 1 hour, recoat after 2 hours. Covers up to 100 sq. ft. per quart. Cleans up easily with soap and water. Available on Walmart.com in 13 colors: White, Cameo Coral, Chalk Gray, Blue Juniper, International Gray, Platinum Ring, Yellow Duckling, Smokey Eyes, Toasted Poppyseed, Swedish Blue, Basic Teal, Red Flare and Authentic Navy. 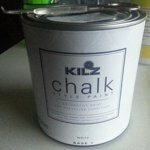 I received the KILZ Chalk Style Decorative paint in the color white in exchange for my honest review. We just recently had to replace the molding around our back door. We purchased our home in 2007 so there has been some wear and tear. After replacing the molding, we tested this paint on the wood surrounding the door. I am not a paint connoisseur, but I was really impressed with the quality of the paint. The paint was really easy to apply, and I was very pleased. We are new to this home improvement stuff, so we did not do any prep work before painting the door and the paint applied seamlessly and even. It doesn't take much for a full coverage finish. One coat coated the door very well, but we went ahead and did a second coat to be on the safe side. This paint dried really fast. The door molding was completely dry after approximately 2 hours. Most paint has very strong fumes; however, this paint did not. I was a little concerned because we do have a small dog. The clean-up was a breeze. The paint easily washed out of the paintbrush. We didn't get much on our clothes but the little we did came out also. Just as good as the others! I received this product from the Spark Reviewer program. In my opinion, the KILZ Chalk Style paint is as good of a product as any of the other chalk paints on the market and certainly not as pricey as some! I have used many, and I didn't find this inferior in any way. Application and clean up was very easy. Dry time was fast. I used the Blue Juniper color, which is a beautiful light aqua. One coat sufficiently covered an old shelf that needed new life. I would not hesitate to recommend this paint to others. I would purchase this product again. My almost teenage girl decided it was time to update her room to a more mature look now that she's almost a teenager. She decided a grey color would be serious enough. I wasn't sold on the idea, specially when she asked for paint, but I told her that we could make gray an accent color. I got her KILZ Chalk Style Decorative Paint in smoky eyes color because it wasn't too dark nor too bright. She loved the color as soon as it arrived, but I would not let her paint the walls nor the furniture. We went shopping for unfinished accessories instead and let her paint those. Without using any primer, she just started painting. She hand shook the can for a few minutes and it was ready to go, no lumps. She used the clamps that secured the lid to open the lid. The paint was thick enough that it wasn't dripping on her. And she did not need to have a second coat because it covered everything very well. A few things on her desk, dresser, and reading nook are now gray. More painting is needed before she considers her room complete. But I have to admit I do love the color. This paint is great. I repainted my bathroom vanity and it looks great. Went on so smoothly I didn't have to add another coat. So easy to clean up with soap and water Now I'll need to buy a bigger size to paint my daughters dresser that is black. I will try and make it an Emoji theme. I'll post thr after. I highly recommend this. I liked the textured of this paint, it's thick enough for an easy coverage. I ordered the Smokey eyes and the color it's rich and dark, which I was expecting it lighter that it actually looks at the time of purchase at the website. I can compare the color with a dark grey. I also have to mention that the company secures the can very nicely for safe shipping (see photo) kudos for that! I received this Kilz Chalk style paint and was really excited to try it out. I have worked in finishing for years and still continue to use and try different techniques as often as I can. This is definitely a unique finish. There is little to no prep work required to use Kilz chalk style paint. I didn't need to do anything to the piece I was working on although the directions did suggest a light sanding if needed. I just made sure it was free of dirt or dust and starting applying the chalk style paint. It went on nicely and was completely covered in two light coats. Clean up was easy. The paint dried rather quickly. I was impressed. It is a great product for upcycing and repurposing projects. If you read over the instructions on the can, it also gives the info for the Kilz sealing products that can be applied over the chalk paint to seal and age/antique the piece that is finished. There's also more information and "how-to's" on the Kilz.com website if you would need any extra help. Overall, I really liked the unique finish and finished look of this paint. I would definitely recommend this as something to try when attempting to re-do a piece. The kilz chalk style decorative paint looks like regular paint. I ordered and received the cameo coral. If you're looking for pink, this is your color. I expected something a little bit more coral as the name suggested. For a kilz product, it took several coats to cover the tan paint that was on the wall. It also took several coats to cover a spot where I decided to get creative and then changed my mind. In that aspect I was pretty disappointed. However, it does look nice (for pink). I have only had it on the wall a couple days so not sure the duration of the paint life or if it stands up to younger children yet. Make sure to check out the pictures. We used this product on some furniture that was actually in very good condition. We just wanted to update the look of our home to country coastal after we moved. Combined with teals and light blues and greens this product on furniture gives a great look without much labor! I've always done woodworking and step one is normally SAND, not so in this case. I did wipe the project down with a clean rag and some isopropyl to strip any old wax off though the can states that's not even necessary. There is s specific type of round faux horse hair brush that you can get at Walmart that makes application even more professional looking. Simply stir the can for a minute and apply directly to the surface. We laid it on thinly on one table and gave another two coats and distressed the edges with sandpaper. It's not necessary though there ia a wax that comes in black or white which simply rubs on and allows you to from then on spray dust/wax as usual. The black also adds an antiqued look so try an inconspicuous area first. Our dog chewed the leg on an otherwise perfectly fine coffee table and this came to the rescue, otherwise I'd have been filling with wood putty and sanding. Walmart carries a large selection of "chalk" products, give em a try, it's a fun hobby and looks awesome! KILZ Chalk Style Decorative Paint is for use on new wood, cast stone, concrete or properly prepared metal surfaces. It is suggested that it is not used on horizontal areas with foot traffic as that will scuff up and ruin the paint job. This paint goes on as a matte and has a chalky look. While this paint can be applied on surfaces with little to no prep, the downside is that you need to seal it with a wax afterwards if you want a vintage or distressed antique look. It dries quickly to the touch within one to two hours and then you can apply a second coat. It goes on really thick and provides nice coverage. One quart of this paint will cover about one hundred square feet. This paint can also be used as a chalkboard paint. You will just need to use a darker color to contrast the chalk along with a base coat primer. The color I have is called Platinum Ring. It is a very light gray or silver color and it looks nice on my sample projects that I have however I like more of a gloss to semi-gloss look. Overall, this paint is nice but after all the things you will need to purchase to create the intended affect such as distressing or a vintage look, I would say it is not cost effective. Would I choose to get this in the future? Probably not but if you don't mind all the extra steps you need to achieve the desired look, then this is a nice paint. There are many tutorials you can look up in order to see how to use this and what all you can do with it.